The Sierra Leone Association of Journalists has slammed the sudden violent attacks and deadly threats on journalists allegedly by supporters of the All People’s Congress (APC). On Wednesday,16th January 2019, journalists from the African Young Voices(AYV) were physically assaulted and their equipment seized allegedly by APC supporter, when they went to cover the interrogation of former President Ernest Bai Koroma in Makeni by personnel of the Criminal Investigations Department(CID). BBC Umaru Fofana also received anonymous death threats via WhatSapp audio allegedly from an APC supporter. The attack in Makeni and the death threat against Mr. Fofana was condemned by some members of the public, who urged the leadership of the APC to control their supporters. In a press release issued on Friday, January 18, 2019, and signed by its National Secretary General, Ahmed Sahid Nasralla, SLAJ expressed grave concern about the ugly trend and the impunity that seemed to be going on with it. The journalist body is worried when they learnt about the similar circumstances, leading to the recent murder of Ghanaian investigative journalist, Ahmed Hussein-Suale, whose death is being associated with a politician. “We therefore put the leadership of the APC on notice that we will hold them responsible for any harm done to AYV journalists and more importantly Umaru Fofana, whose life is being threatened,” the release stated. The leadership of the APC was urged to rein in on their members and supporters and stop them from venting out their frustrations on harmless journalists, who were busy doing their work. The association also called on the government to continue to honour its promise, and stop arresting and detaining journalists at the CID, but rather send them to the Independent Media Commission (IMC) for action. The Inspector General of police, Richard Moigbeh, was urged to bring to book the APC officials and supporters, who allegedly assaulted Ibrahim Samura, leading to his death and to speedily investigate the assault on AYV reporters and the source of the whatsapp voice note death threats against Umaru Fofana. 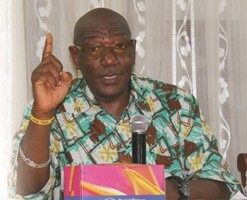 SLAJ urged all politicians from the ruling Sierra Leone People’s Party (SLPP), and more so the APC, to work together towards de-escalating the political tension presently in the country forthwith as they cannot continue to hold the people of Sierra Leone to ransom because of their selfish political interests. However, the APC in a press release signed by its National Publicity Secretary, Cornelius Deveaux, described the statement from SLAJ as far-fetched from speaking in good faith in the interest of safety and wellbeing of journalists. The APC claims that AYV reporters were attacked on the premises of the party’s Chairman and Leader and as endorsed by SLAJ is totally untrue and deliberately misleading. “We believe that whatever may have happened outside the precinct of the residence of the Chairman and Leader has been prejudiced by the police and we expect no good outcome different from the seeming conspiracy by SLAJ, AYV and the police to present the APC in a bad light in view of public perception,” the release stated. The party assured that if they receive any official complaint from any aggrieved person (s) or institution(s), the matter will be seriously looked into and where necessary, defaulters shall be held accountable.